Zoran Živković was born in Belgrade, former Yugoslavia, in 1948. In 1973 he graduated from the Department of General Literature with the theory of literature, Faculty of Philology of the University of Belgrade; he received his master’s degree in 1979 and his doctorate in 1982 from the same school, where he is currently a professor of creative writing. 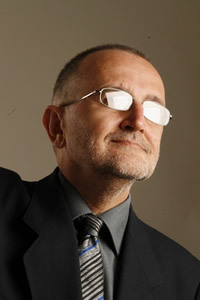 Živković is the author of the eighteen works of fiction: The Fourth Circle (1993), Time Gifts (1997), The Writer (1998), The Book (1999), Impossible Encounters (2000), Seven Touches of Music (2001), The Library (2002), Steps through the Mist (2003), Hidden Camera (2003), Compartments (2004), Four Stories till the End (2004), Twelve Collections and the Teashop (2005), The Bridge (2006), Miss Tamara, The Reader (2006), Amarcord (2007), The Last Book (2007), Escher’s Loops (2008) and The Ghostwriter (2009). Živković received numerous literary awards. The most prominent among them is the World Fantasy Award (2003) for his mosaic-novel The Library. Nearly fifty foreign editions of his books appeared in more than twenty languages. Several feature films and TV series were based on his works. He lives in Belgrade, Serbia, with his wife Mia, their twin sons Uroš and Andreja, and their three cats.